I do feel guilty that I often brazenly ignore my screaming TBR pile in favour of the free ebook samples that litter my Kindle. It’s a new favourite pastime of mine: loading up on recommendations from GoodReads and the likes, downloading simply all of the samples and flicking through them one by one, deciding which ones deserve my attention. I’ve deliberately placed my TBR shelf next to my bed, tomes I’ve owned for yonks just glaring at me while I consistently reach for new books I’ve only just heard about. 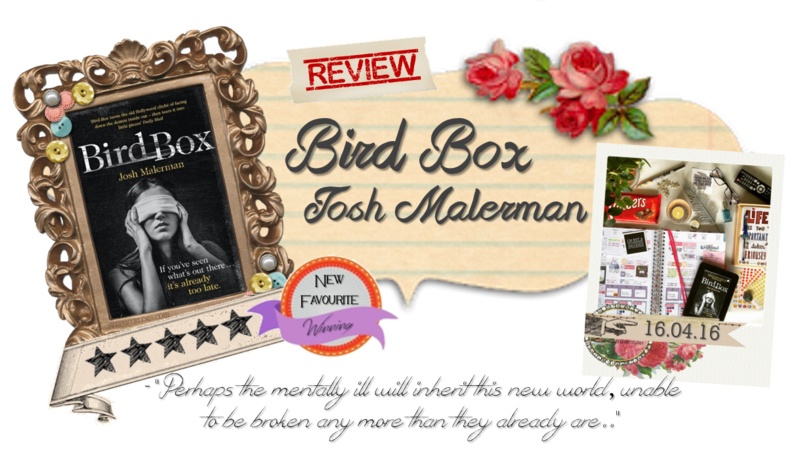 So when I pick up a story like Bird Box, I feel justified. There’s a reason I pick up quite a few books on a whim: and it’s because I find a lot of my absolute favourite books this way. Bird Box is, to pick just one word, brilliant. A psychological thriller, the story takes place both at the beginning of an apocalypse and four years after the event. It’s an interesting premise in that no one really knows what’s going on. All they know is that people are snapping, becoming homicidal, suicidal, and all because they saw something. Pretty soon, it becomes a global epidemic and the world as we know it comes to change. Those who remain have to survive in a world where they cannot look outside. They live in boarded up houses, only venturing outside to scavenge for essentials. But they must do this blindfolded, coming up with ideas for systems to help each other navigating, all the while not even knowing what the threat even is. Malorie is a single mum of two kids born in the first year of the apocalypse. Named simply Boy and Girl, we follow her in the fourth year after this apocalypse, risking everything she has to get to a new safe haven by rowing twenty miles down a river. Blindfolded and exposed the whole way. I didn’t imagine just how many boxes this book would tick for me. First off, it’s a fresh new take on survivalism (my absolute favourite genre) in a post-apocalyptic setting. I haven’t read a survivalist novel so refreshingly different since The Martian and I wish the story could have gone on forever. It was fantastic to watch a small community of people attempting to survive in the aftermath of an apocalyptic event while being blindfolded whenever they went outside. It’s tough enough finding food, water, medical supplies, etc in a dying world but can you imagine how much harder it has to be while you can’t see anything? Not to mention the terrifying thought that you could be wandering down a deserted road trying to find food and there is the distinct possibility that something is there. This threat. Whatever it is that drove people to madness and ended the world as we know it. Whatever this threat it, is could be right in front of you. Watching you. Waiting to see if you’ll give into the fear, the need, and open your eyes. And on top of feeding my survivalist lit cravings, this book also completely nailed the psychological thriller genre. Not only is it brilliantly written and the whole scenario expertly portrayed (and not to mention, genuinely scary), our protagonist Malorie’s relationship with her children is absolutely fascinating. The children were born to a hostile world and from day one Malorie has to train them to survive. They don’t have to be educated, particularly happy, or even loved. They just have to be fed and taught how to live in a new world of constant threat. It’s a brilliant addition to the already fantastically thrilling story. It makes you wonder how you would live in this terrifying world, and how you would protect your own children. Malorie is unrelenting with the children. She’s harsh and cold, but it’s for their own good, right? But the reader can’t help but feel the detachment there. It does beg the question: does she truly love her children? I’m mad about this book (ha!). It was practically flawless in its execution, so clever, so new and interesting and very, very scary. I cannot recommend this one high enough guys, go read it now! Exciting review 🙂 Makes me want to read the book – if I dare! Your description reminds me of the feelings I had when I read The Day of The Triffids years ago. Sometimes an author can convey the characters’ fear so well the reader can really experience it too.